We have a weekly planning session where we’ll decide what recipes we want to blog over the coming month, and recently it’s morphed into “what different kinds of curd can we make now?”. Here’s the tally so far. One: The original lemony lemon curd, delicious in its pure form, and a tasty addition to zucchini cake. Two: rhubarb curd – the difficult second curd, you might say – absolutely amazing in taste, quite appalling in visual appearance (which is why we shoved it in pastry shells and covered it in fruit and mascarpone). 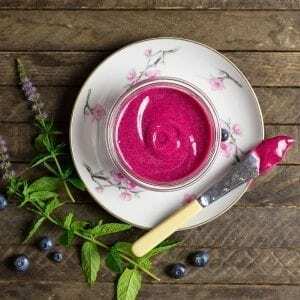 And now, the third in the series: the revenge, Part Trois, blueberry lemon curd. Other than the crazy hue, what’s the verdict? 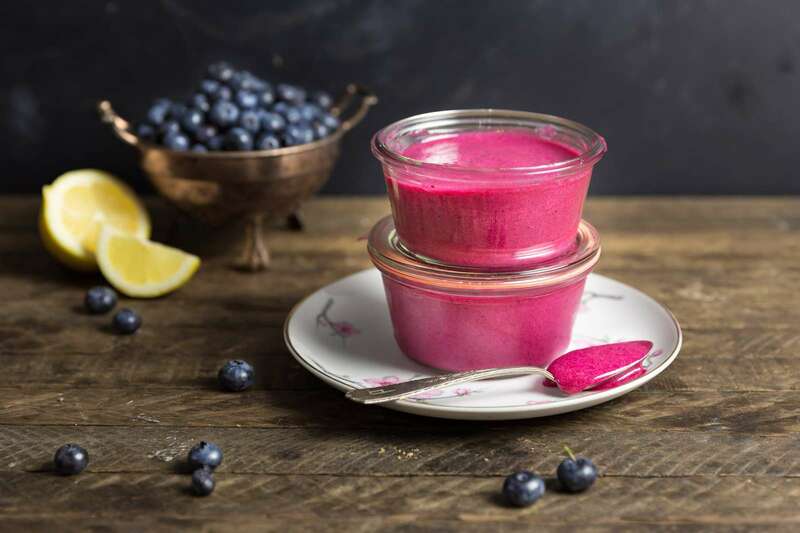 The blueberries, once cooked down, release their sugar complement and cut the acidity of the lemons, so this ends up being a really well-balanced curd that won’t pucker your mouth up. It’s like if blueberry jam and lemon curd had a really attractive and well-behaved love child. We would not be ashamed to use this in any of the curd recipes we have put together, and it goes beautifully just slathered on breakfast toast. Because it was so gorgeous, though, we decided to go all out and use it to fill tartlets. 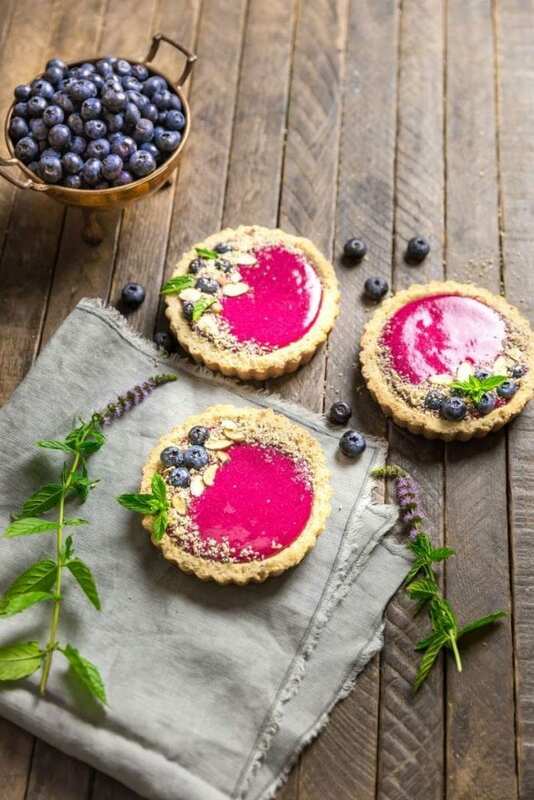 We list our recipe for blueberry lemon curd tartlets separately. Almond Shortbread shells, filled with our Blueberry Lemon Curd – Find the recipe here! This might just be the pinkest thing we’ve ever made. Please join us on our next curd making adventure, when we will be exploring the ultraviolet spectrum. Until then, curd your enthusiasm! Add the blueberries. lemon zest and water to a medium (2 quart) heavy-bottomed saucepan set over medium-high heat. Bring to a boil, lower heat and simmer until the blueberries soften and burst, about 5 to 7 minutes. Use a spoon to press berries and break apart berries as they cook. Strain into a bowl through a fine mesh sieve, pressing pulp with a spoon. Make sure to scrape the puree on the underside of the strainer into the bowl. Allow puree to cool. Discard the pulp and rinse the saucepan and sieve. In a large bowl (or a stand mixer fitted with the paddle attachment), beat the butter and sugar until fully combined, about 2 min. Add the eggs and yolks one at a time, beating each until incorporated. On low, mix in the lemon juice, blueberry puree, salt and cornstarch. The mixture will look curdled, but it will smooth out as it cooks. Pour the mixture back into the saucepan and cook over low heat until thickened (about 10 minutes), stirring constantly. Don’t walk away or you will have lemony scrambled eggs. The curd will thicken at about 170 degrees F, or just below simmer. Remove from the heat and strain into a bowl through the rinsed sieve. Add curd to storage jars and allow to cool to room temperature before refrigerating. Curd will get thicker as it cools. If using in tarts right away, allow to come to room temperature before filling shells. The looks beautiful! This is probably a dumb question but do the storage containers need to be sterilized? Hi Carmen – it’s a great question! We’ve never done any long-term preservation for curd, although you can use a canning process and store in the fridge for a few months. If you plan to do that, you should certainly sterilize. For short-term storage, it’s not a bad idea to sterilize, but you should be equally fine just washing the jars well with very hot water and then not handling them too much before you fill and seal them. I followed your instructions to the key and the colour was definitely NOT pink but a dark purple?????? That’s fine! You’re going to get some variation depending on the color of your blueberries and eggs. How did it taste?